In a comprehensive evidence-based review, the Centers for Disease Control and Prevention provides 19 sets of recommendations for diagnosing and managing mild traumatic brain injury in children. A new evidence-based guideline from the Centers for Disease Control and Prevention (CDC) offers 19 sets of recommendations on the diagnosis, prognosis, and management of mild traumatic brain injury in children 18 years and younger. Published online September 4 in JAMA Pediatrics, the guideline reviews the literature on imaging, symptom scales, cognitive testing and standardized assessment for diagnosis, history and risk factor assessment, monitoring and counseling for prognosis; and patient/family education, rest, support, return to school, and symptom management for treatment. Specific domains for treatment included headache, sleep, physical and mental activity, psychosocial/emotional support, and vestibular-oculomotor management. Heightened awareness of pediatric concussions was a major catalyst for designing a guideline focused specifically on mild traumatic brain injury in children, Matthew J. Breiding, PhD, the study's corresponding author and a behavioral scientist who leads the traumatic brain injury team in the CDC's Division of Unintentional Injury Prevention, told Neurology Today. Workgroup members geared the guideline toward emergency department physicians, primary care clinicians, even athletic trainers and school nurses — “anyone who is involved in the clinical care of a child with concussion,” Dr. Breiding said. They also crafted educational materials tailored to clinicians and parents, as well as a letter for clinicians to provide for sharing with a child's school. The goal is to help the student return to the classroom and prior functioning. “We have a number of dissemination materials we've developed and put them in a user-friendly form, so the uptake of the recommendations can be increased,” he said. Furthermore, the authors recommended that clinicians use the term “mild traumatic brain injury.” They pointed out that although “concussion,” “minor head injury,” and mTBI are often used interchangeably, the descriptions have different meanings for families, researchers, and health care providers. In the clinical evaluation of pediatric patients with mild traumatic brain injury, the workgroup advocated for age-appropriate and validated symptom scales, said Christopher C. Giza, MD, FAAN, a co-author of the guideline and professor of pediatrics and neurosurgery in the University of California, Los Angeles–Mattel Children's Hospital. “It's important to recognize that kids aren't just little adults, so we have to use kid-friendly assessments, interventions, and counseling,” Dr. Giza told Neurology Today. The initial systematic literature search spanned from January 1, 1990, to November 30, 2012. In the updated literature search, the dates ranged from December 1, 2012 to July 31, 2015. Each workgroup member reviewed and voted on all of the potential recommendations. An 80 percent response was needed for each recommendation before tabulation. And each recommendation was marked with a degree of obligation — must, should, or may — based on confidence in the evidence. The authors also advocated for updates to the recommendations as the body of evidence continues to mount. “The authors are very deliberate in their comments. The science of mTBI [mild traumatic brain injury] is rapidly progressing,” said Bert B. Vargas, MD, FAHS, associate professor in the department of neurology and neurotherapeutics at the University of Texas Southwestern Medical Center in Dallas. Dr. Vargas concurred with the diagnostic recommendations advising health care professionals to consider risk factors before routinely ordering head computer tomography for diagnostic purposes in children. According to the guideline, clinicians should use validated clinical decision rules to identify children with mild traumatic brain injury at low risk for intracranial injury in whom a CT scan of the head is not warranted, as well as youth who may be at higher risk for intracranial injury for whom such a scan may be indicated. “We tend to overutilize imaging studies, and we put a burden on the health care system and expose children to needless tests,” Dr. Vargas said. In another recommendation, the guideline highlighted that patients, families, and providers can underestimate the amount of time it takes for symptoms to resolve after mild traumatic brain injury in children. To set reasonable expectations, the authors elaborated on the typical progression of symptoms and the usual pattern of recovery, he said. Various factors may prolong recovery in some children, the CDC guideline noted. Among them are a prior history of concussion, lower cognitive ability, learning difficulties, and neurological or psychiatric disorders, said Barry Kosofsky, MD, PhD, professor of pediatrics, neuroscience, and neurology at Weill Cornell Medicine in New York. “There are a lot of instruments you can use to make a prognosis,” Dr. Kosofsky said. “You shouldn't rely on any one of them. If a child's condition is not improving, you have to drill down further,” he added. The new guideline is slightly more current, detailed, and nuanced, with a focus entirely on pediatrics, he said, in comparison to the previous guideline from the American Academy of Neurology, as well as those from the American College of Sports Medicine and the American College of Physicians, he said. The recommendations related to treatment have evolved since the release of the AAN guideline, which endorsed very few specific therapies, said Sean C. Rose, MD, assistant professor of pediatric neurology at the Ohio State University College of Medicine in Columbus and co-director of the Complex Concussion Clinic at Nationwide Children's Hospital. He noted that newer aspects of management may include active rehabilitation, vestibular therapy, school accommodations, sleep hygiene, headache medications, neuropsychologist involvement, and referral to a multidisciplinary clinic or a specialist. “A few years ago, the evidence was not there at that time to recommend these things,” Dr. Rose said. Cocooning, or complete rest, seemed to be counterproductive in improving outcomes, according to the CDC guideline. While in many instances the recommendations dovetail with current practices and reinforce their strengths in this formal outline, Dr. Vargas expressed concern that the presence of severe headache alone was an indication for imaging in the emergency room — especially since headache is among the most common symptoms after concussion. In addition, he said it was disappointing that the diagnostic recommendations did not touch on ocular motor and balance functions, which many neurologists or providers who evaluate concussion assess during their evaluation of patients who have incurred mild traumatic brain injury. “It would be important for people to know what the diagnostic utility of these tests was,” Dr. Vargas said. Nonetheless, the recommendations lay the foundation for future research. “All guidelines should be scrutinized and systematically challenged to make sure they are up-to-date,” he said. Dr Giza reports receiving fees as a consultant to the National Football League Neurological Care Program, National Hockey League Players' Association, National Hockey League, Major League Soccer, National Basketball Association, US Soccer Federation, and the National Collegiate Athletic Association; medicolegal work on one or two cases annually; and research support from the National Football League and General Electric. Dr. Vargas serves on the advisory boards of Allergan, Amgen, Novartis, Upsher-Smith, Lilly, Teva, Biohaven, Promius Pharma, and Alder. He receives honoraria from Autonomic Technologies. Dr. Kosofsky is the founder of b2d2, a medical device company focused on improving the diagnosis and treatment of concussion. •. Lumba-Brown A, Yeates KO, Sarmiento K, et al Centers for Disease Control and Prevention guideline on the diagnosis and management of mild traumatic brain injury among children https://jamanetwork.com/journals/jamapediatrics/fullarticle/2698456. JAMA Pediatr 2018; Epub 2018 Sept 4. •. Giza CC, Kutcher JS, Ashwal S, et al Summary of evidence-based guideline update: Evaluation and management of concussion in sports. Report of the guideline development subcommittee of the American Academy of Neurology http://n.neurology.org/content/80/24/2250. Neurology 2013; 80(24): 2250–2257. 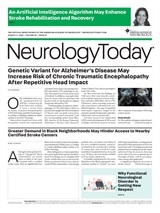 Neurology Today18(22):1,25-28, November 15, 2018. Neurology Today-NeuroBowl Case Challenge: Hypertension, Hyperlipidemia, Type 2 Diabetes: Case Solved!